Earn 145 - 260 points upon purchasing this product. Use 1450 - 2600 points to purchase this product! Unlike other plant nutrients such as soy isoflavones, diindolylmethane (DIM) has unique hormonal benefits. It supports the activity of enzymes that improve estrogen metabolism. 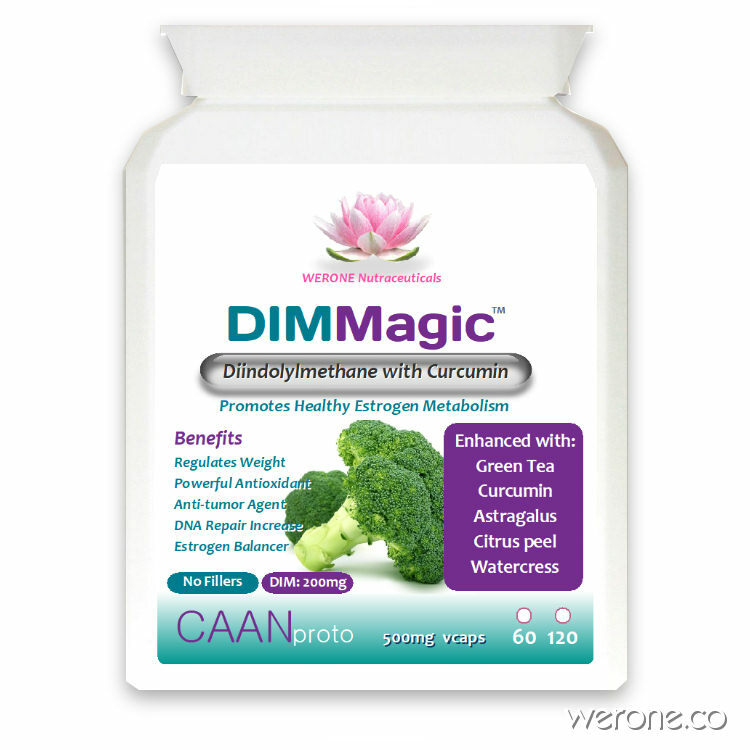 DIMMagic™ contains DIM (Diindolylmethane), a phytonutrient naturally occurring in cruciferous vegetables such as broccoli, cauliflower, cabbage, and kale. DIM promotes metabolism of estrogen and aids in healthy hormonal balance. It optimises the ratio of crucial estrogen metabolites necessary in breast, uterine, cervical and prostate health. DIM also acts as an aromatase inhibitor, often present in the drugs used to treat breast and ovarian cancer in postmenopausal women and those cancers that are estrogen dependent in premenopausal women. Aromatase inhibitors reduce the overproduction of estrogen and allow testosterone to balance. DIM can boost both mood and libido. It should be used as a supplement for estrogen dominance when there are insufficient cruciferous vegetables being eaten or there is significant estrogen imbalance. DIMMagic™ has been further supported by additional herbs which reduce estrogen and in-activate many anti-cancer and inflammatory pathways. These are Astragalus, Green Tea, Curcumin, Astragalus, Citrus peel & Watercress. Diindolylmethane continues to demonstrate medicinally beneficial qualities in animal and clinical experimentation. It exhibits antioxidant, antiangiogenic, chemopreventive, anticancer, antiproliferative, anti-inflammatory and other properties and actions. 3,3′-diindolylmethane (DIM) is the in vivo self-dimerized product of indole-3-carbinol which is derived from cruciferous vegetables. It is an inhibitor of aromatase and Estrogen. AR, EGFR, PTEN, MTA-2, Nf-kB, PI3K, RAS, AKT, GSK-b3, mTOR, IKK, mIR-221, TGF-b, ZEB1, P27, P57, PUMA. Qian et al. assessed the effect of DIM given intranasally against lung tumorigenesis. Lung tumorigenesis was induced in mice using 4-(methylnitrosamino)-1-(3-pyridyl)-1-butanone (NNK). According to their observations, after administration of DIM, there was 72% reduction in lung tumor multiplicity. In the case of large tumors, there was complete abolishment and for 0.5–1 mm tumors there was 74% reduction. There was 82% reduction in tumor volume. Further they used in vitro lung tumorigenesis model for further studies which showed that in both premalignant and malignant bronchial cells, DIM showed apoptotic and antiproliferative effects and in parental immortalized cells there were minimal effects. These effects were found to be, at least in part through PI3K pathway suppression (Qian et al., 2013). DIM has shown other anti-cancer activities [70; 90; 105–107]. In gemcitabine-resistant pancreatic cancer, DIM increased the levels of miR-200 family, let-7 family, and miR-146a, resulting in the reversal of EMT, inhibition of invasion, and induction of sensitivity to gemcitabine through the inhibition of EGFR, MTA-2, IRAK-1, ZEB1, and NF-κB signaling [70;90]. Moreover, DIM also inhibited pancreatic cancer cell growth and migration via the down-regulation of miR-221 and subsequent induction of PTEN, p27kip1, p57kip2, and PUMA . These findings demonstrate the role of DIM in the regulation of miRNAs, suggesting that DIM could be useful in the therapy of pancreatic cancer, and thus further in-depth studies are warranted. NOTE: It’s important your DIM supplement does not contain soy, many do, but this one is SOY free and Fillers free! 1 capsule with a meal twice daily. Additional benefits may be obtained by adding Adrenal Magic, Vit D3/K2, Omega 3 (Krill or Fish Oil) & Melatonin (before sleep). Do not take more than 400mg a day as the effects can tip the other way. Hyponatremia (low blood sodium) is a possible DIM side effect, especially in instances of heavy dosing (600mg +) or prolonged usage. It is more commonly experienced in women than men, in the elderly, and in hospital patients. CAUTION: Women who are pregnant, planning to get pregnant or nursing should not take DIM. Women who are using oral contraceptives (birth control pills) should consult with a health care professional before taking this product. Persons taking prescription medications should consult with a health care professional before using this product. My wife has endured a significant amount of abdominal pain during key points in her cycle for a number of years, the doctors carried out various tests but found nothing significant to explain it and put it down to her hormones but offered no solutions. After much research on the internet I worked out that she was likely suffering from what is termed Estrogen Dominance. I discovered that DIM(diindolylmethane) can help to balance the condition. Once she started taking 3 a day the pain vanished within about 5 days. The effectiveness of DIM on the condition could not have been more marked if it had been an expensive prescription drug. She has been taking DIM for about 2 years now with no adverse effects but If she slips up and forgets to take them for a few days the original symptoms start to return. It’s a miracle! By Noodlynoo . OMG these have changed my life! I take them along side Calcium D-Glucarate for menopausal hot flashes and they have virtually gone!! A little price to pay for the effect they have its worth every penny! After only a few weeks on these I came off my HRT. If you suffer hot flashes, try these! I have an issue loosing weight and tend to find my hormones are quite irregular and a major contribution to weight gain is my high estrogen levels, I have been taking this supplement on and off and tend to find when I’m taking it regularly I’m not fatiguing, feeling a lot less stressed, I tend to drop slightly in waist size and my bloat and face swelling goes down. Don’t take HRT, these work & are safer! Absolutely changed my life, I still need to work on hormones every month but it certainly gives me the base. I started the menopause about a year and a half ago and one of the most distressing symptons I had was breakouts. Not just regular breakouts but the mother of all breakouts on my chin, round my mouth and upper lip area. I changed my skincare regime, went dairy free, alcohol free, changed my makeup to mineral based, purchased all kinds of vitamin pills, changed my pillowcases every day, washed makeup brushes daily, I did everything I could to try and tame it, but it wasn’t subsiding. It started as just another day of googling trying to work out why things were not getting any better, plus I missed cake and wasn’t sure how long the dairy free diet would last and I came across DIM. I thought as this has all started since the menopause began then perhaps it isn’t something I’m doing but that my hormones are all over the place and until I sort them out then the breakouts aren’t going to get better. I purchased my first tub of these about 8 weeks ago and I am now on my second tub. These are AMAZING. The first week of taking these I noticed a difference, the breakouts on my chin were reducing in numbers and for the first time in a year and a half I could see clearer skin through the redness and bumps. I was worried about side effects so I kept a close eye on this and I didn’t get headaches like some, but I did have tummy ache for the first 2 weeks of taking these and then I purchased some liveregen support tablets and since I have taken these the tummy aches have gone and I have noticed nothing else worrying. It has been 2 months now and my breakouts have stopped, I am now trying to clear the red marks left behind with peels and facials from my local salon, but it is all going brilliantly. I urge everyone to try these if they have the same issues as me as it’s given me back the confidence to face the world again. Great for PCOS and estrogen dominance! Been using for almost a month. It’s dramatically reduced my chronic headaches, which I assume is related to my estrogen dominance, I sleep better, I feel better! I hope it keeps improving for me but it’s worked wonders already. Helps my estrogen dominance and hopefully, will balance my progesterone and testosterone levels too. BRCA1 mRNA levels following a 4-6-week intervention with oral 3,3′-diindolylmethane. Indole-3-carbinol and its metabolite 3,3′-diindoylmethane (DIM) target multiple aspects of cancer cell-cycle regulation and survival including Akt-NF kappa B signaling, caspase activation, cyclin-dependent kinase activities, estrogen metabolism, estrogen receptor signaling, endoplasmic reticulum stress, and BRCA gene expression. Indole-3-carbinol as a chemopreventive and anti-cancer agent. Low levels of 3,3′-diindolylmethane activate estrogen receptor a and induce proliferation of breast cancer cells in the absence of estradiol.